Yes, you read that right. 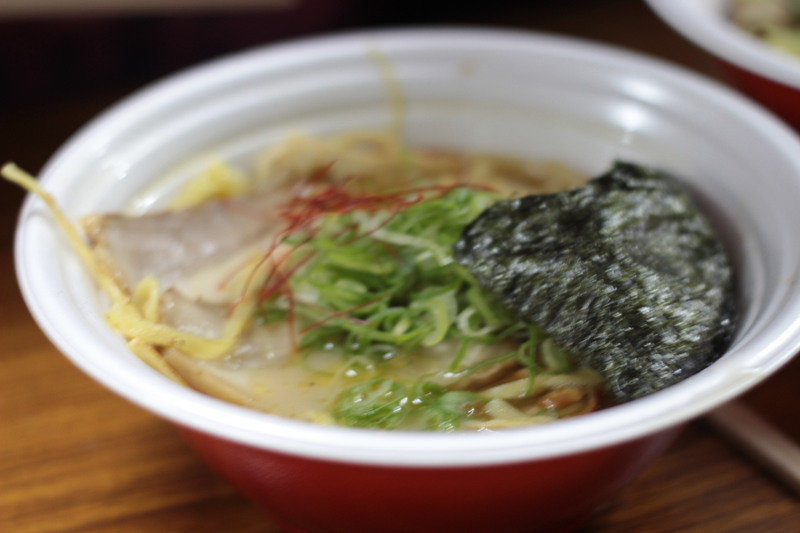 This is Round 2 – I went to Tokyo Ramen Show twice! For all the info on this heavenly event, read Part 1. I’m going to cut straight to the noodle and tell you what was worth eating – and believe me…. ROUND TWO WAS EVEN BETTER THAN ROUND ONE. 1) Sorry for the sub-standard photos… I was wearing glasses instead of contact lenses, and I took them off to take photos. This was a mistake – I’m clearly going blind. 2) Thanks to Mu for his comments and typing up all the ramen scores. The below is thanks to his hard work. 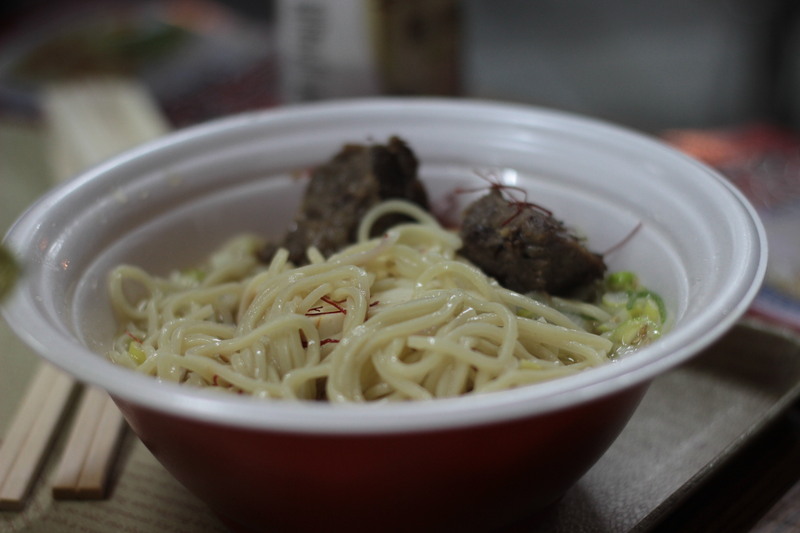 Mu: Ramen noodles are normally boiled, but they use special noodles which are wide-flat shapes and are pan-fried. This process makes the noodles stay hot for a very long time. The broth is chicken base with vegetable purée. The taste is not too oily, not too strong and とてもおいしい (really delicious). Ph: Mu is right – this ramen was a tongue burner for ages afterwards. I loved the fried noodles in broth concept as it’s different from all noodle dishes I’ve ever sampled but really does add extra flavour. A couple of noodles were a little bit chewy (overly-fried) but all-in-all top marks. Once again, chicken broth comes highly rated – it’s just so tasty, and I guess it demonstrates why chicken stock is so widely used in recipes (or, at least, my household in the UK!). Apparently good things happen when ramen restaurants collaborate. Mu: The broth is miso-based (with rice malt) with lobster (伊勢海老 (Ise Ebi), sesame oil, oysters ,garlic,etc. The owner says the most important thing is the balance of ingredients. It has a rich taste with slight lobster flavour. Ph: I love meat (pork or chicken) flavoured broths as they are the richest, most complex and, in my opinion, tastiest… so it was pleasant surprise just how much flavour this one packed. However, for me, it lost its impact during the eating process so I knocked it down a mark. Mu: The ox tongue is soft and おいしい (delicious)! I love this broth which tastes healthy (light, non-oily), made of seafood, salt and oyster. On the evening of November 2nd, only this restaurant sold out. Ph: Oh my goodness, how delicious was the ox tongue? It was my first time and I was a little bit irrationally squeamish at the thought of eating something that had been lolling about inside a cow’s mouth for quite some time. But it was like the tenderest, most flavoursome piece of beef I’d ever eaten. I can’t wait to eat it again! But the broth was just too plain for me. Healthy, yes – but unexciting! Mu: The broth is chicken and crab. 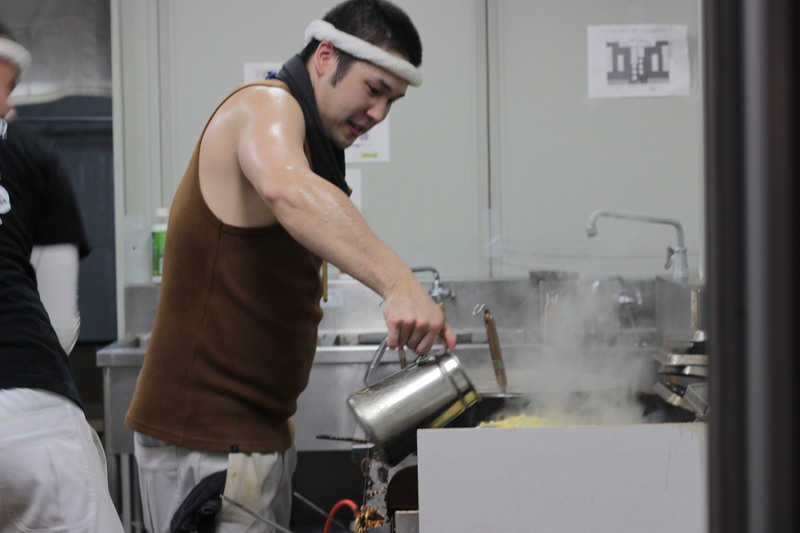 This ramen is developed by pro wrestler… Usually I don’t like these type of restaurants (true professional artisans’ (職人) ramen is the best! ), but this bowl was delicious! Ph: Again CHICKEN. It’s a sign. Chicken broth won Round 1 after all! I couldn’t get enough of this one either, even though I don’t like crab. A whole lot of flavour in that meat! No.12 濃厚味噌「炎・炙」肉盛そば (Noukou Miso「Honou・Aburi 」 Niku-mori Soba)【金沢麺達兼六会(Kanazawa Men-tatsu Kenroku-kai)】from Kanazawa, Ishikawa, Hokuriku. Average: 7.625. Mu: This store sold the most ramen last year making it the Tokyo Ramen Show Champion 2013. The broth is miso and the taste is very strong. The pork back rib is burned on cast-iron pan at the last minute. 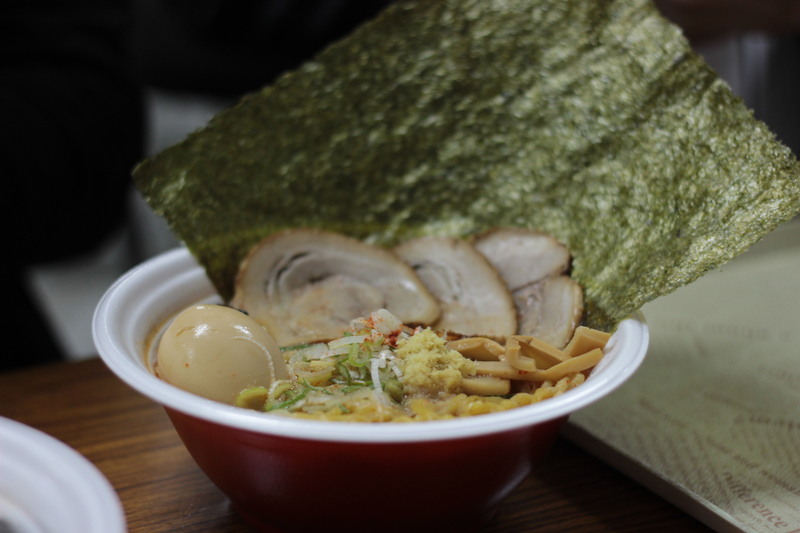 Ph: This ramen reminded me of kimchi – it was has a very strong fermented taste, salty and spicy. It’s really delicious but it’s so strong it gets overwhelming. I don’t think I could manage more than a half a bowl. The meat was melt-in-the-mouth delicious though. No.5 鶏だし魚介ブラック肉盛そば (Tori-dashi Gyokai BLACK Niku Soba )【麺屋いろは(Menya Iroha)】from Toyama, Tohoku. Average: 6.83. Mu: Tokyo Ramen Show Champion in 2009, 2010 and 2011 by number of sales (it did not participate in the 2012 and 2013 show). 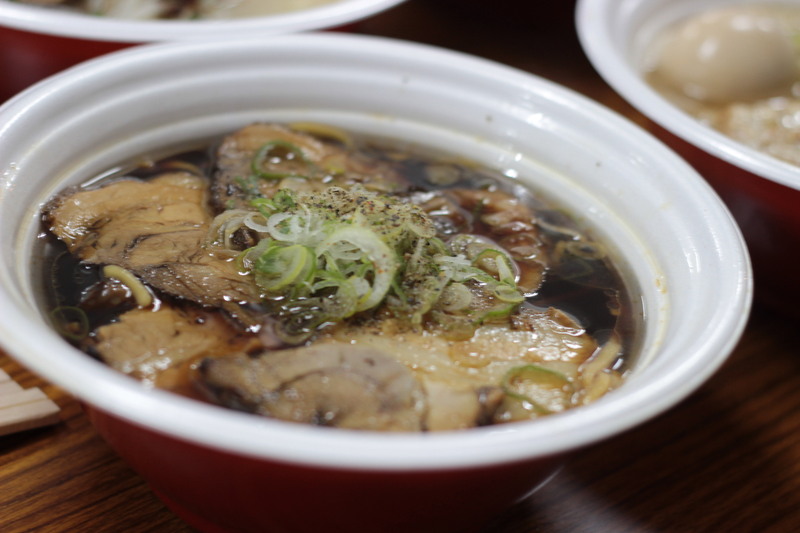 The broth is a mix of chicken, seafood and black-soy sauce. The most famous point of this bowl is very, very strong salty taste known as “Toyama Black (富山ブラック)”. This bowl has two kind of char siu – pork loin and back rib. 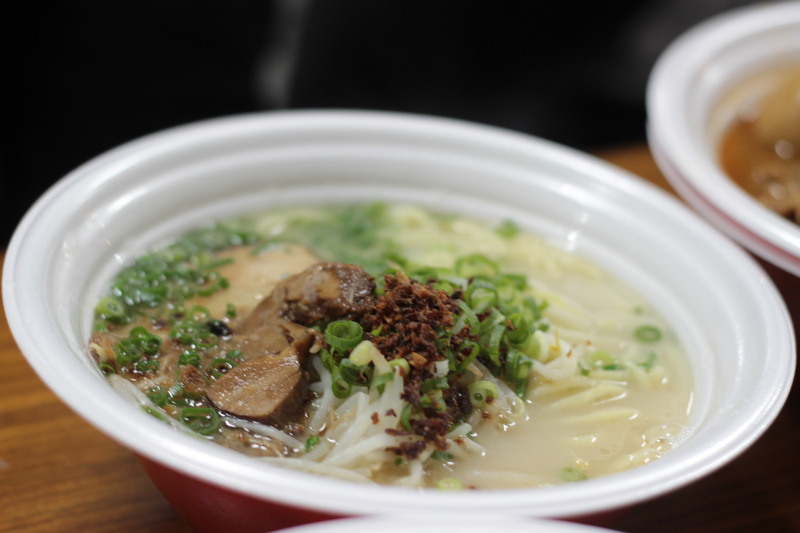 Ph: When I first tasted the broth, I found the strong saltiness of the soy very one-dimensional but the flavour grew on me. I guess my tongue took a while to locate the chicken flavour! 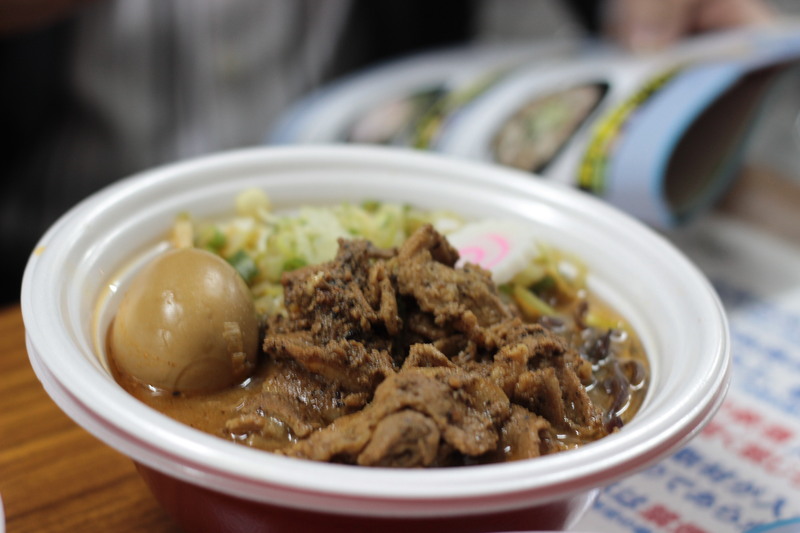 No.7 鹿児島 豚と鶏のW白湯スープ (Kagoshima Buta to Tori no W Pai-tan soup)【麺屋 二郎 × 麺屋 剛 (Menya Jiro × Menya Tsutoshi)】from Kagoshima, Kyushu. Average: 7. 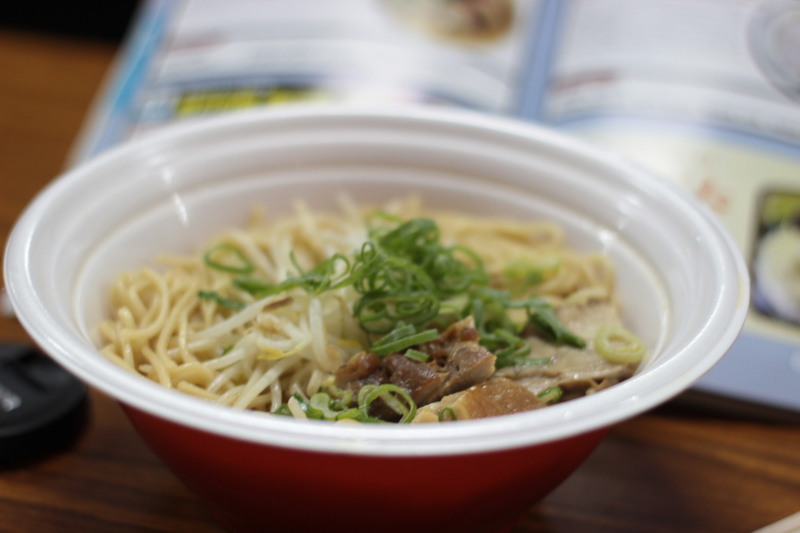 Mu: It has a very light tonkotsu (pork) and chicken taste. The fried green onions add an accent to the light-taste broth. Ph: This is the only bowl I can’t remember. I think this means I was very unexcited by it. Me and lightly flavoured broths just don’t go together! No.8 渡り蟹の白湯そば (Watari-Gani no Pai-tan Soba【中華蕎麦 とみ田 × 麺屋一燈 (Cyuka Soba Tomota × Menya Ichitou)】from a corporation. Average: 4.67. 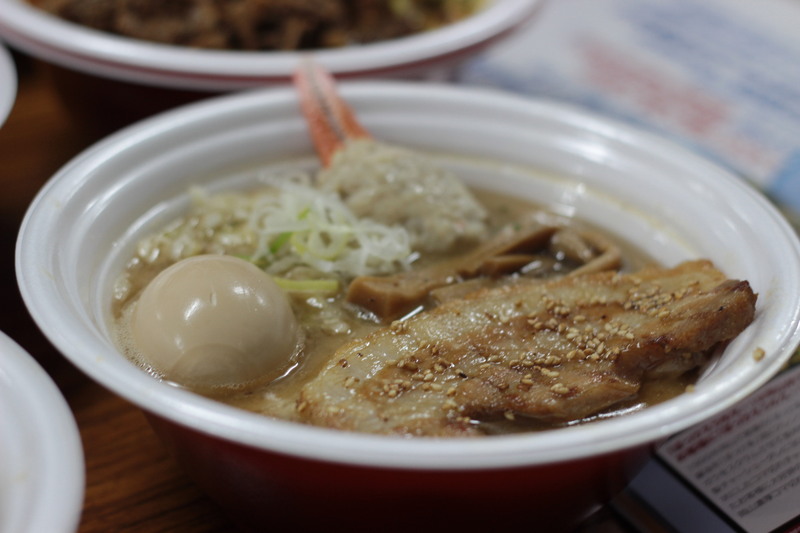 Mu: I couldn’t eat lots because the soup is too oily and thick – it is made from a mix of soy sauce and blue crab. The crab claw is served in the bowl. Ph: This broth certainly has flavour but it is so oily that it’s like trying to glug oil directly from a bottle. My lips were moisturised for days! The brochure describes its oiliness level as normal, which is a blatant lie. No.1高田馬場ラーメン組合鶏ポタ焼麺 (Takata-no-baba Ramen Kumiai Tori Pota Men)【焼麺 剱×我羅奢(Yakumen Turugi × Garasya)】from a special ccollaboration of ramen restrants at Takata-no-baba,Tokyo. Average: 7.83. I’m feeling very smug as this was my first choice! 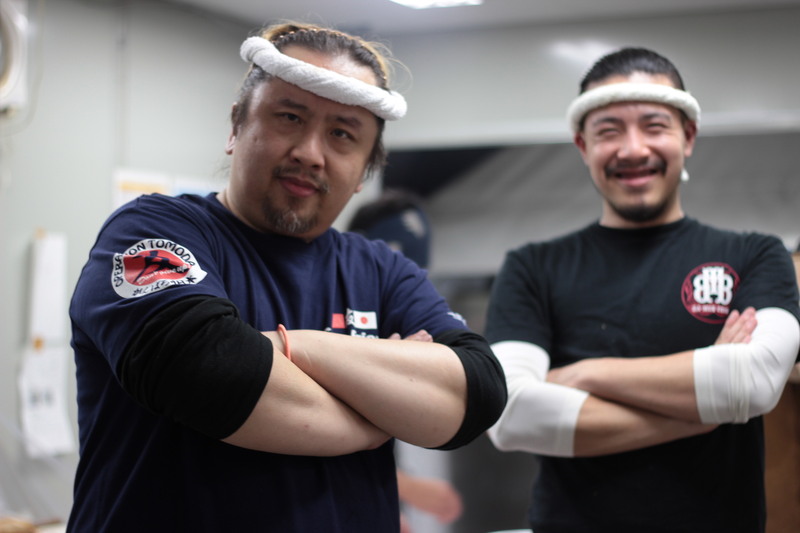 If you’re in Tokyo, don’t miss the Tokyo Ramen Show next year.